So the telephone rang yesterday afternoon with a friend from the Association of Professional Genealogists on the line. 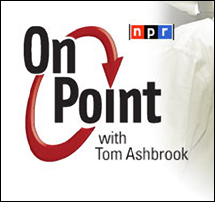 On Point, the Boston-based daily talk show on National Public Radio hosted by award-winning journalist Tom Ashbrook, will be focused on genealogy today — today! — at 11 a.m. EST (10 a.m. CST, 9 a.m. MST, 8 a.m. PST). Could The Legal Genealogist be available to join in the discussion? Except for this minor little problem of the cold I picked up in Salt Lake City last week that has me still sniffling a bit. Fortunately, with the marvels of modern medicine, at least some of the cold symptoms can be mostly alleviated. And with the marvels of modern technology, where there’s a telephone line, there’s a radio studio. So, sure — The Legal Genealogist is joining A.J. Jacobs, editor at large at Esquire magazine and author of Drop Dead Healthy: One Man’s Humble Quest for Bodily Perfection, and Dr. Spencer Wells of National Geographic’s Genographic Project in a discussion of Crowdsourcing And The New Genealogy Boom. It was A.J. whose piece “Are You My Cousin?” in The New York Times not quite three weeks ago sparked the program. He’s a fan of crowdsourced genealogy, including the merged online family tree sites such as WikiTree, WeRelate and Geni and the DNA sites like 23andMe and Family Tree DNA. And nobody understands crowdsourcing and its advantages better than Spencer Wells, whose Genographic Project is the ultimate in citizen science crowdsourcing. Me? I figure I’m the token traditional genealogist who — despite being a major fan of genealogical crowdsourcing (a fancy modern name for collaborative research!) — is still hoping to convince folks that we need accurate information underpinning our crowdsourced data. So come join us if you have an hour later this morning. A map and list of the stations carrying the NPR broadcast is on the On Point website, and it’ll be archived and available as a podcast by about 2 p.m. EST this afternoon. And about that cold and the snow? I think I still have some of my voice this morning. And, so far, the power (and heat) has stayed on. Plus the landline telephone should continue to work even if the power goes out. But if one of the participants sounds a bit nasal and a bit muffled… you’ll know why. Hi Judy, I’m listening to you right now! Love it. Thanks for the kind words, Jean! Tom Ashbrook does a nice job as host! I loved your comments on NPR! Thank You!!! I wish I had found your site earlier today. I missed the show. Hope you are well. Glad to find you! Ever since our meeting, I have been intrigued with finding out who we are. I have even tracked down forgotten, lost or unknown cousins on Facebook! I do have a question relating to our Revolutionary War ancestors. I would like to know who they are and the states of service. Do we directly descend from any signers of the DOI? We don’t have any ancestors in the line you and I share who signed the Declaration of Independence, Angela (remember: my great grandmother and your grandfather were half-siblings; I don’t share your Livingston line). On the other side, the one ancestor we share that we know served was William Noel Battles who served in the Revolutionary War from Virginia and received a pension in Alabama. Thanks for the reply. I hope you will post the link to your NPR interview. I look forward to hearing it. It’s up now, Angela. If you go back to the On Point page for the show (here), there’s a recording to click on at the top (the big red arrow at the top). Thanks. By the way, you should know Alton Livingston died two weeks ago at age 95 and Raymond Kidwell died last summer at age 104. Thanks, Angela. I heard from your Mom when I got back from Salt Lake City last week. Sure was sorry to hear about your Uncle Alton. You were great in the interview! You made so many important points. Our WikiTree Greeters are still struggling to keep up with the new members. By the way, you’re not the only one who came home from SLC with this cold. I’ve got it and another WikiTree team member does too. The good news: As of today I’m almost at full strength. This seems like a short-lived one. Good luck with the crush of new visitors, Chris! And thanks so much for the kind words. Now if I can just get this cold into the “short-lived” category — it’s been a week already yet!